Online video offers non-broadcast news outlets an added layer of storytelling which can help visually illustrate complex stories, share compelling moments in a few seconds of CCTV or put the viewer face-to-face with raw human emotion. In this feature we find out the most effective ways for online publishers to maximise the online medium for video journalism and the added opportunities for audience engagement, extended reach and revenue - not just for newspapers or online news outlets, but for broadcasters just as keen to understand the needs of the digital audience. Understand the power of the key video "snippet"
Andy Dickinson, senior lecturer in online journalism at the University of Central Lancashire, said for the local press in particular, online video has worked "as a different kind of content on their website that will attract a certain kind of user". And the sort of video which has worked well "is the kind of viral clip video". "It's not the package stuff, where they've taken the time to script it and it's got cutaways, the stuff that would look more like a traditional broadcast package, although stuff like that exists and it's done as broadcast does it, sometimes it's done well, sometimes it's done badly, but it's those little snippets, the bits of CCTV, the bit of video snatched at a scene either by a member of public or invariably by a journalist with a mobile phone or some kind of lo-fi recorder. "It's that stuff that drives traffic. From a broader online content perspective I think it's stuff that makes best use of the diversity of online storytelling. When you need to see something moving, when you need that dynamic storytelling that video gives you, that visceral 'here we are in a situation and suddenly something happens'. "They have that in their palette of storytelling tools. So what's really nice to see is the move away from the requirement to use video to the point where video is being used when it works best." John Domokos, video producer for the Guardian, added that the "general feeling" at the Guardian is that online video fits in best where it offers "the powerful bit of footage" as part of a package of content, instead of trying to tell "fully formed stories" in a video alone. "What we need to do is package stuff up so that maybe contextual and factual things might go more into articles or blogs, whereas the video contains the powerful bit of footage, the artifact you might call it, the key interview either from a whistleblower or from a victim, a human interest interview. A really strong bit of footage that backs up, verifies and brings to life a story you might also be telling in other ways in text." So is there a need for news outlets to bring something new to the table when it comes to online video, particularly for broadcasters? Not according to Marek Pruszewicz, editor of the BBC's global video team. "I know a lot of people have believed for an awful long time that video online is different, I really don't believe that, I've never believed that. "I believe good video is good video. The treatments might be different, but you'll find the kind of stories that engage audiences on television if you look at the engagement figures the BBC picks up for its audience it's pretty regularly on stories, I bet you the correlation between those and the stories that do best online is a pretty strong one." And not just for broadcasters. For newspapers and online video the key remains good content, Dickinson concurred. "What they need to do is look in general at what people are consuming and say 'well do we need to reinvent the wheel?'. I think from a news point of view I don't think they necessarily do. "If a reasonably well-framed medium close-up with a bit of interview footage works then why do anything different? There is a side to that which says actually the form is changing because of the technology that we're using. "So a medium close-up is really easy to do if you've got a tripod and a camera on the tripod and you've got a camera person and a reporter. If what you've got is a mobile phone and one person then the medium close-up is really hard to do. "So we're seeing a change in the form where people are talking more directly to the camera, which broadcasters would balk at still, I think. But that's not through design, that's probably more through necessity. So it's one of those things where I'd say to newspaper people 'don't sweat it'. "If what works best for you is producing what looks like broadcast, then that's absolutely fine." That doesn't mean, of course, that there are not interesting examples emerging of web-original video which really make the most of web technologies. 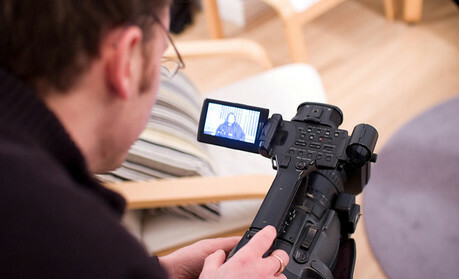 Dickinson observed that there is a "separate development trend" of video journalism taking form online. "Look at MediaStorm and look at those kind of nascent online video journalism platforms and you see a different kind of journalism happening there that's different from the mainstream use of video on news websites and broadcasters. To some extent that's a little bit more interesting but I think it's something different." Andy Plesser, founder and chief executive of Beet.TV, identified that there are some traditional newsrooms making efforts to do more in the way of "web-centric" video though. "I think that the news organisations understand that video will be consumed increasingly through digital devices, not necessarily the linear broadcasts, and there's a big effort underway for these news organisations to generate a great deal of original, web-centric video which is very exciting and there's many flavours of that, that are bubbling up. "Some are just un-edited video of a scene, there's also more casual reporting from the field and then there's web original videos that are not really made for television but specific web packages." As well as the delivery of online video, new digital platforms such as mobiles and tablets, have also presented news outlets with new audience viewing behaviours compared to the way online video would be accessed on computers. Pruszewicz said video has been a "completely different story on mobile devices, on smartphones, but especially on tablets", in terms of audience engagement. "One of the interesting things that has happened over the last year and this looks like it's going to get bigger and bigger, is the amount of video people are playing from the BBC on their tablets." And interestingly he added that the peak viewing times on such devices have seen a shift back to times more closely mirroring that of traditional TV broadcasts. "Peak use online has always been around lunchtime, which I guess is people who are working, taking a break, and either using their PC at work or getting out the office with a laptop. "For mobile devices, especially tablets it's completely different. Peak usage is first thing in the morning, either as you wake up over breakfast, or as you're travelling on the train and you use your iPad to catch up on something, and late at night, you go to bed with your iPad and put on BBC iPlayer or get the website up and watch some video. "That's a really interesting correlation because that is a much stronger correlation to the way people watch TV news for instance then the way they currently access news online." Domokos said statistics have shown that shorter video online is more likely to be watched all the way through, and that also users may be put off clicking on a video in the first place based on the length - so it is an important consideration. He also highlighted the importance of getting to the point of the video as soon as possible. "We have ads - which we have to have, that pays our bread and butter - before the film that people have to sit through. Really you've got to reward them by getting into it. "You don't need a bit preamble, setting the scene for the story, you can do that in text on the page. People want you to get to the key bit of footage, the killer bit of emotion, without any fluff or build-up you might have in traditional video storytelling forms. "It's not that we only do short videos, each film will merit it's length hopefully and some films do need to be told in slightly longer form, but even those have to have very minimal baggage around them because people will kick off. It's quite a brutal audience online, they will click off the video if it's not gripping them every step of the way and not giving them real raw video footage." Interestingly a couple of the people Journalism.co.uk spoke to for this feature discussed examples of how live digital news reporting had offered another element to the online video of a news outlet. Domokos highlighted this point in reference to a recent series by the Guardian, Breadline Britain, which was also liveblogged. He said this meant he could put a video up in the morning and then use the livelogging platform to add "extra testimony, things that didn't make the film, an extra bit of footage that's relevant in the aftermath of the story and backs it up, extra quotes as text, tweets", and as a result give the film "a life beyond just going up and disappearing out into the ether". "You get the reactions of people and the participation of community in real time," he added. Looking at the impact of live from another angle, Plesser referenced the Wall Street Journal and the way it edits its live webcast content into shorter clips on-demand, which could help news outlets which may be looking for ways to increase the amount of video content being produced. "It's a good way to produce more content and also engage an audience through live video so I think the creation of live and editing that, re-purposing it as clips for on-demand, is valuable." Some news outlets may be unsure about footage which may not stand up to its usual quality control, but when it comes to audience expectations the focus should remain on the content, Domokos says. "It's not that people expect or are willing to accept lower quality overall it's just that they will forgive lower technical quality if the content is compelling. "If what's happening on screen is interesting, then they will forgive the technical quality of the shot. It doesn't mean we set out to film things in a shoddy way, and certainly the video journalists here still use proper kit and try and film things as well as we can but even myself, in some situations, willingly sacrifice quality in order to blend in or have slight of foot in difficult situations like the riots last year for example." Pruszewicz added that there are not "any hard and fast rules" when it comes to quality, but that generally speaking "the harder somewhere is to get to, the newsier the story, the more exclusive the footage, the more you're willing to put up with it being of slightly ropey quality". "If you have got something that looks extraordinary that nobody else has got, an extraordinary story from somewhere where it's really hard to get footage, then you are more likely to tolerate that regardless of the quality and that could be user generated content, it could be something shot on a small camera by a producer somewhere very remote. "Are you willing to tolerate that kind of quality in a TV report shot in Manchester by a professional camera? No you're not. And you shouldn't expect to. But the rise of user generated content has again taught people to view video in slightly different ways. The immediacy of UGC means they are happy to live with the fact the quality is not going to be as good as if it's been professionally shot." When it comes to revenue models for online video, Plesser said that the "pre-roll" has become "a very common experience" and as such has become "sort of standard". But he added that some publishers are finding a "mid-roll" better, which arguably more closely resembles the typical television viewing experience when it comes to advertising. "I think the introduction of mid-roll is going to be part of the scenario," he said. He also highlighted that for niche publishers in particular, "the sponsorship scenario is really the most practical right now". "There's a big opportunity around sponsorships for publishers to leverage their video experience in a very highly monetisable way, and very high rates, by working with brands that are suitable for them and want to be associated with an audience they've created. "For smart consumers of video, they're fine with seeing a pre-roll but I think it's important that pre-roll is germane to them and that the publisher in turn sells this to advertisers who find a value in that publisher's audience. "So the strategy around monetisation is more of a sponsorship kind of thing. So we're seeing that more and more where big corporate sponsors, services companies, or package companies, or technology companies want to be associated with certain brands and they create identity around those videos."